The Friday Fun & Easy Landscape Challenge July 20- June 26: Draw a landscape using the Rainbow Eucalyptus step-out. Extra calorie-free brownie points for creating your own variation of this beautiful tree. This has been a busy week, and I’m just getting everything finished as it’s about time to post. The step-out and drawing are very simple, done very quickly. But I hope it shows you that you don’t need a lot of time to draw and color a landscape. Mine was drawn and colored in around 10 minutes. The Rainbow Eucalyptus is a real tree – I recommend you Google it, because it’s darn cool! The first photo I saw of one, I thought someone had slapped paint all over the tree. Tools: Hahnemühle Hand Lettering Pad, Zebra Pens – Sarasa Fineliners to draw the step-outs. Zensations Technical Pen to draw the example. Mildliners to color the example. 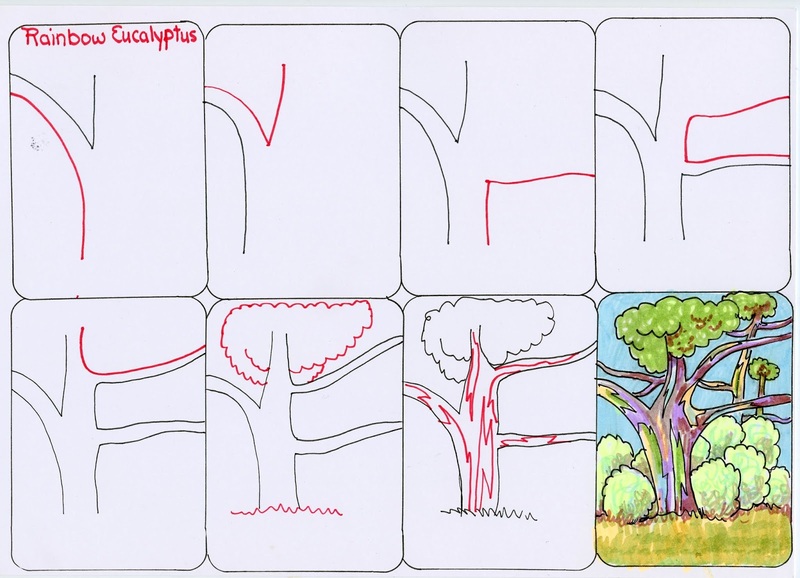 So watch the video, and let’s draw the Rainbow Eucalyptus! and sharing your landscape drawings.